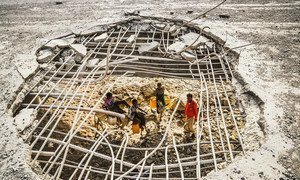 Any attack on the key Yemeni port of Hodeida would deepen one of the world’s worst malnutrition crises and put the lives of an estimated 300,000 children at risk, said the head of the United Nations Children’s Fund (UNICEF) on Tuesday. UNICEF Executive Director, Henrietta Fore, said that she was “extremely concerned” about continuing reports that forces from the United Arab Emirates which are part of a Saudi-led coalition battling Houthi rebels who currently control Hodeida, are planning an imminent attack to recapture the city. Conflict has escalated between the two sides since 2015, leaving around 75 per cent of Yemenis in need, including around 11 million children. On Monday, UN Secretary-General António Guterres, told reporters in New York that “intense negotiations” involving his Special Envoy for Yemen, Martin Griffiths, were taking place, which it was hoped could prevent military confrontation. “I hope that it will be possible to avoid a battle for Hodeidah,” said the UN chief. Also speaking on Monday, UN relief chief Mark Lowcock told correspondents at UN Headquarters that “dozens of UN staff” were still in the city. “While the UN and other humanitarian organizations are reconfiguring their presence, it is also our plan, intention and hope, to stay and deliver. We have dozens of staff still in Hodeidah,” he added. “Ninety per cent of the food and medicines that are consumed in Yemen are imported and seventy per cent of those imports go through Hodeida. Seven million people are completely reliant every month on food, and more than 7 million on other assistance, from humanitarian organizations,” said Mr. Lowcock, who is also UN Humanitarian Coordinator. He said that if the port were to close for any period of time, or “not to operate effectively, the consequences in humanitarian terms would be catastrophic”. “Without fuel, critical for water pumping, people’s access to drinking water will shrink further, leading to even more cases of acute watery diarrhoea and cholera, both of which can be deadly for small children,” she added. Any attack on the key port city of Hodeidah in Yemen “will impact hundreds of thousands of innocent civilians” and would entail around 250,000 civilians losing everything - “even their lives” - the UN Humanitarian Coordinator for the war-torn country said on Friday.